Style icon and Suits star Meghan Markle has another reason to smile! The actress is the new brand ambassador for the Reitmans Fall/Winter 2015 collection. Meghan, who spends more than half the year in Toronto shooting the show, is excited to be a part of the campaign and help re-energize the brand. We caught up with the actress while she was shooting the Reitmans campaign. She was all smiles as she discussed her collaboration with Reitmans, her character Rachel Zane on Suits and how her website The Tig came into being. Tell me about your collaboration with Reitmans! It was great when they approached me. Being born and raised in L.A., I wasn’t familiar with the brand but what I loved is what they’re trying to do – they’re a family-owned business for 90 years and it’s time for a bit of re-energizing. They’ll still have all the classics but a little bit hipper, a little bit more chic – pieces that are a bit more trend-driven. I loved the idea of being a part of something like that. I felt really honored that they asked me to be the face of this campaign. You know, I love a pencil skirt. 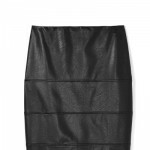 I love the Faux Leather Pencil Skirt that they have. It’s a boho-chic ’70s piece that is really hip for Fall. What’s your go-to style of dressing? Oh man, I’m a California girl so I still love jeans and a T-shirt. But I think my style has now become a bit more polished, especially since working on Suits. So now my jeans will have a nice belt and a beautiful stiletto and the perfect T-shirt that hangs just so. I think the devil is in the details. For me, it’s still about classic dressing, but with that little edge that makes it look chicer. What do you think is a staple that every woman should own? Of course, every woman needs a perfect little black dress. But you know what, I take that back. You just need that killer dress that makes you feel like a million dollars when you put it on. I also firmly believe every woman needs a crisp black blazer. I wear that all the time – I think it’s great for travel, it’s great for a polished look! It’s kind of an entire look! I can’t agree with you more! How much say do you have over your outfits on Suits? You know what, our wardrobe designer is so collaborative with me and I think especially now it’s been so many years and I have a strong sense of what Rachel’s aesthetic should be and she knows that. A lot of colors in Rachel’s wardrobe echoes how she is feeling emotionally. Softer tones when she is in love or more black or grey when she is going through difficult things. How has playing Rachel Zane impacted your style? I think more than anything it has given me the best education in fashion. It’s exposed me to so many designers and I’ve started to go to New York Fashion Week in the past few years so that alone has piqued my interest more in this world and it has certainly made me feel excited to have a hand in a collaboration like this where I can potentially be helping to design some pieces. I love that idea. Playing this character has showed me so much of fashion that I would not have known otherwise. What similar traits do you share with Rachel? We are both just fiercely ambitious. I think we are both also sensitive but I don’t cry as much as Rachel. But I do think there’s something in our drive. Rachel is finally getting her dream wedding. How excited are you? I know! It’s so exciting! It’s been really fun to play a bride-to-be and to hopefully see the wedding happen this year! We still have a few more episodes to film in season five – so we will see! What can you tell us about the remaining of season five? Nothing! (laughs) Just kidding, I can tease a couple things but they guard our scripts so much; our names are watermarked across them. We don’t get them much more than an episode before we shoot one. I don’t know much more than the viewers do. I just finished shooting episode ten – which I will say things shake up in the biggest way that they have, both at the firm and in everyone’s personal lives. By episode ten, you are going to be shocked! I’m so excited already! Suits has a great cast – what’s it like working with Gabriel, Patrick, Rick and Sarah? Is it just as fun off-screen? They are amazing! We have become not just friends but family. I got birthday wishes from all of them. Sarah sent me a video with her two daughters singing Happy Birthday. They were some of the first people I heard from because we really are so close-knit. I would say I’m closest with Rick and Sarah. Patrick and I have been friends for a while now. We worked on a show a few years before this that didn’t get picked up. We have potluck at each other’s houses and we keep in touch during the hiatus. I love my cast for sure. Rachel is now Harvey’s associate this season and it has been so much fun to have scenes with Gabriel. The only problem is we drive the crew crazy because we can’t stop laughing. I know, I can see that banter and cheekiness! That must be so much fun! This season has really been my gigglefest of Gabriel! We will be working on a scene and we just get caught up in the work and cannot stop laughing! You know when it’s not even funny but you can’t stop. That’s us! What inspired you to create your lifestyle website The Tig? The name Tig is from a glass of wine called Tignanello and the first sip of that wine I had several years ago, it was an “aha!” moment for me. It was literally the moment of understanding the body structure of a glass of wine. I then took that nickname ‘Tig’ and applied it to all these other moments I’m getting in my life! Including going to New York Fashion Week and realizing clothes can be art. Tell us something no one knows about Meghan Markle? It’s all encompassing. Our hiatus is quite brief because we know we are doing a sixth and seventh season so I have that to look forward to. I also have a secret project on the side for The Tig, which I will be working on between the months of January through March and of course, this collaboration with Reitmans. I couldn’t be more excited to be doing it and to invest more time here in Canada. Thank you so much for chatting with us! Thank you so much! It’s been my pleasure. I really loved chatting with you!